Own Your Own Talladega Superspeedway sculpture of extraordinary realism...meticulously detailed and skillfully hand painted. One of the most exciting tracks in the nation, Talladega Superspeedway hosts the annual DieHard 500, where drivers compete for more than $2 million and the thrill of tearing out the backstretch at 100+ mph for 188 laps. Officially licensed by Talladega Superspeedway, this magnificent sculpture features extraordinary accuracy and fine detail. Every aspect of this world-renowned racetrack is meticulously re-created, from the brightly colored stock cars to the 2.66 mile four-lane tri-oval, banked 33 degrees on each end. Superbly crafted and carefully hand painted by skilled artisans, this amazing replica comes mounted on a handsome hardwood base with a brass title plaque. 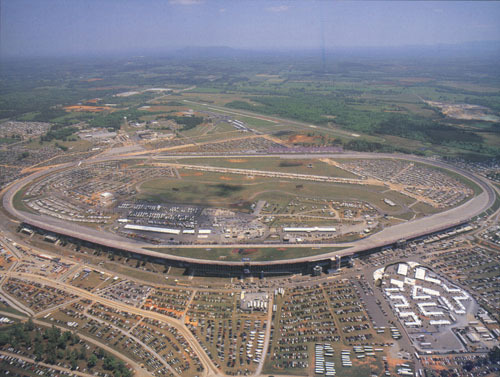 Built at a cost of more than four million dollars, the track opened as Alabama International Motor Speedway in September 1969. The first event there was the 'BAMA 400 Grand Touring race on Sept. 13, 1969. Ken Rush was the winner. The next day Richard Brickhouse won the first NASCAR Grand National (now NASCAR Winston Cup Series) race, the Talladega 500 (now the DieHard 500) by edging Jim Vandiver and Ramo Stott. With plenty of room to expand, Talladega has done just that, adding permanent seating in nine of the last 10 years, including 8,000 tower seats for 1997. It can now accommodate 108,000 seated guests and thousands more in the 215-acre infield. A world record of 221.160 mph for a close course was established at Talladega on Aug. 9, 1975 by Mark Donohue. The mark stood until 1986 when Rick Mears broke it in an IndyCar at Michigan Speedway. In 1987 Bill Elliott established a world stock car speed record when he ran at 212.809 mph in qualifying for the Winston 500. The track offers van tours to visitors daily during working hours except on days of racing, testing and special events. Adjacent to the track is the Motorsports Hall of Fame and Museum, which is also open daily. BALLPARKS © 1996-2007 by Munsey & Suppes.